The fibonacci numbers are a recursive sequence with the first two values as one. Recursive sequences are constructed by doing a certain operation to the terms before and repeating the process infinity. With the fibonacci sequence you add the previous two terms together and the result is your next term in the sequence. I come back to some ideas like that later. If you haev heard of fibonacci numbers then you most likely have heard of the golden ratio. The golden ratio is no more than the limit of each consecutive fibonacci number. But how did I get that? To show how to get the golden ratio we must agree with one big axiom, that the limit exists. Since d is not greater than 1 and d can't be negative(fibonacci numbers are positive), it must be 1. So consecutive fibonacci numbers are relatively prime. Here's a computer program I made that will give you any fibonacci number. all you have to do is tell it which one you want. 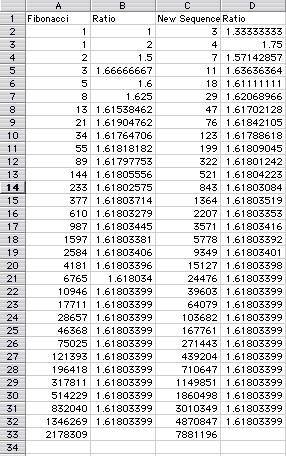 As you can see the ratio of the fibonacci numbers and the ratio of the new sequence are about the same at line 32. The derivation of the golden ratio doesn't have to do with starting with 1,1 like we see so many times. You can start with any two numbers just use the same pattern. Every time the ratio of each consecutive term is aproaching the golden ratio.